Original paintings Art Gallery by artist and writer Violet M. Huntley-Franck. Fine art acrylic realism and expressionism paintings for sale and to view - landscapes, seascapes, portraits, Native American, wildlife and the unusual. 3. Art4me links to art, artists, museum and theater sites. Original Artists Needed! Build your artist website for free and make money with your art at Artist Search.net. Art buyers - search for all types of artists through genres including painters, photographers, idependent musicians, sculptors, graphic designers, fashion designers, architects, illustration, performing arts, and more. Paul Sloan-A Seattle artist devoted to the surreal and romantic. 6. Decorative Easels by Amron. Decorative table top and floor display easel models are available in acrylic, wood, iron, brass, aluminum, pewter, bronze, and copper. 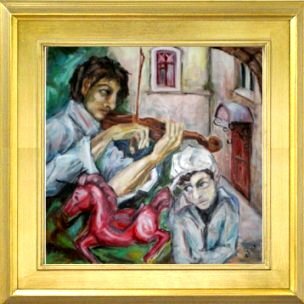 Angeloilpainting.com offers hand painted oil painting reproduction, oil portrait, oil painting on canvas, picture frame, stretcher bar. Salvador Dali paintings, lithographs, etchings, engravings. Experts available to help you collect invest authenticate fine works of art by the master artist.